Footballs Coming (to your) Home? On the 18th June England will officially kick start their World Cup campaign. Gareth Southgate’s men will line up vs Tunisia in the Volgograd Arena, the weight of a thousand football clichés on their shoulders. The previous tournament ended in tears after England’s return from Brazil came all too early, two group stage defeats to Uruguay and Italy embarrassingly sent the Three Lions home – their first group stage exodus since 1958. Russia 2018 feels different, the squad is encouraged by quiet optimism. A gentle hum of “Football’s coming home” can be heard reverberating through pub gardens across the country, car windows are being adorned with miniature St. Georges flags and Kieran Trippier has already volunteered to take a penalty in our inevitable shootout vs Germany. 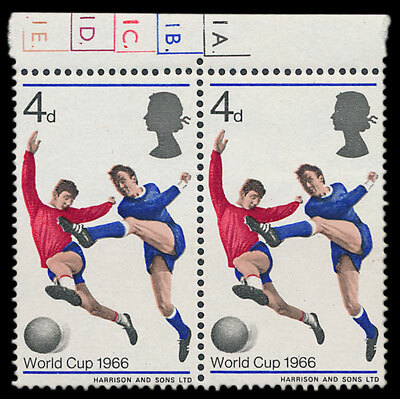 Whilst anticipation, fear and excitement grow in equal measures, it is worth looking back to 1966 and England’s greatest football achievement (and of course the philatelic material produced in celebration). Our upcoming July stamp auction features two covers honouring the nations achievement at the 1966 tournament. Lots 147 and 148 – both signed by the late Bobby Moore – were produced in commemoration of the 4-2 home victory over West Germany in the final. A goal from Martin Peters and a hat-trick from Geoff Hurst, including a late finish immortalised by BBC commentator Kenneth Wolstenholme’s “Some people are on the pitch. They Think It’s All Over .. [Hurst Scores] It is now!” saw England crowned champions. Of course in classic British fashion this performance was acknowledged in the form of commemorative philatelic material. 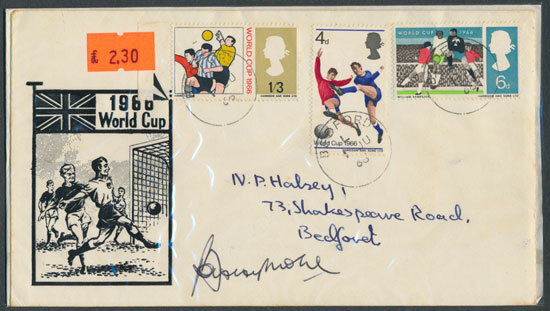 Lot 147 features all three of the special stamps released for the tournament: the 4d (Players with the ball), 6d (Goalmouth Melee) and 1s3d (Goalkeeper making a save). The stamps are arranged on an illustrated hand addressed cover and all individually cancelled. Lot 148 features the same 4d stamp with a slight alteration, where previously there had been a white space above the players heads the words ‘England Winners’ have been printed. This was a re-release specifically marking England’s tournament success. 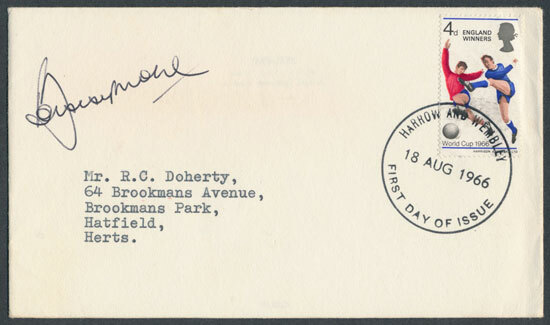 The cover is very neat in its presentation, with the plain envelope having a typed address and clear ‘Harrow and Wembley’ handstamp. Both covers are completed with the signature of the much celebrated Bobby Moore who captained the victorious 1966 squad.